In Sunrise, Florida armed guards or unarmed guards can keep people safe and provide total peace of mind. Our company, Millennium Protection Services, has a wealth of experience in the security field, and we can and will provide you with a totally secure environment. We have armed guards on our staff who are highly experienced and fully licensed, and we also dispatch unarmed guards. Your safety is our business, and we can provide a solution if you need protection at any level. One of our areas of specialization is security patrol services. If you own or manage an apartment complex or condominium community, security is going to be one of your responsibilities. We can work with you to devise a plan that keeps everyone in your community safe and sound, 24 hours a day, 365 days a year. We also provide security patrol services for retail stores and shopping malls of all sizes. If you are organizing a special event, security is going to be one of your primary concerns. You have to control access, and of course, the safety of everyone in attendance is in your hands. Plus, you need security guards to make sure that your inventory is protected. The protection of entertainers or speakers is also something that will enter the picture. We can provide special event security for all types of events, and we would be more than glad to work with you to devise a security strategy for your gathering. As a full-service Sunrise, Florida security company, we are well equipped to provide armed guards or unarmed guards to oversee large groups, but our services do not stop there. We also provide personal security solutions for high profile individuals like athletes, entertainers, visiting dignitaries, corporate officers, etc. Our armed guards can assess risks that you may incur on any given itinerary and provide top-notch, state-of-the-art protection. Total Protection Is a Phone Call Away! 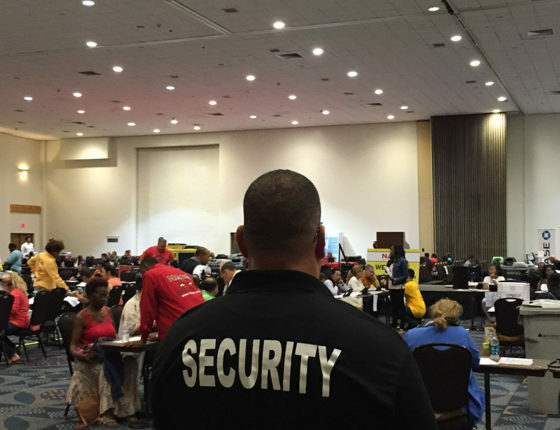 If you are looking for event security, security patrol services, armed guards, or unarmed guards, our Sunrise, FL security company will exceed your expectations. Our security guards are second to none, but we also provide excellent customer service from the first point of contact. To discuss your security needs with one of our consultants, call us right now at 800-493-0806 or 954-668-2780.